This is an Ode to one of My Favorite Groups Pizzicato Five . 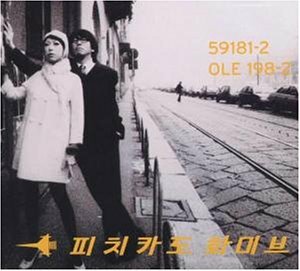 Despite the numerous Japanese bands that have gained a devoted fanbase outside of Japan, one band seems to remain unknown to people's ears: Pizzicato Five. Considering that Pizzicato Five is one of the few Japanese bands to be known within the American music scene, I would assume that they would have a huge fanbase already in Japan. But nearly no one in my family, nor my Japanese circle of friends has heard their music, and the J-Rock lists produced literal blank faces at the band's name. Well, it's about time someone did some introducing! Pizzicato Five is unlike any other Japanese group. A duo of singer Nomiya Maki and producer/musician Konishi Yasuharu, their music and style was aptly labeled by the New York Times, "pop culture thrown against a wall." They combine everything from disco, to bossa nova, to hip hop, to lounge, to drum-n-bass, to pop, to...to... to everything you thought was cheesy and campy. Throw all of this music in, toss in some random Japanese/English/French (They actually speak good English!) and hit the blender on puree. That is about as close as one can get to giving a broad description of the style. Like some of the visual bands, Pizzicato Five relies on an incredible amount of style and imagery to accompany their music. They're visions are a combination of magazine chic, a Tokyo business/fashion atmosphere in keeping with the most stylish of our modern times. At Irving Plaza, their show consisted of at least five different costume changes, with a large screen behind them showing video footage, while you were mesmerized by the stage show performed by Nomiya and Konishi up front. No other J-Rock band equals Pizzi5's level of innovation and craftiness. Recording at least one album annually for fourteen+ years, their work becomes fresher, stranger and more creative with each new release. Also, due to the fact that they have both an American label (Matador) and a Japanese one (Nippon Columbia), different versions of their songs often appear on the two versions of the albums. Thus, the version of "Baby Love Child" appearing on This Year's Girl was then redone in English for the special American debut, Made in USA (a collection of their best songs remade from past Japanese albums). A band that has outlasted many of the current Japanese trends, and a survivor for over a decade, Pizzicato Five is truly something special. I hope that by adding this page to my J-Rock site, some fans will be enticed to investigate some of their music. It's well worth it. Need Tears of Gypsy ? Disclaimer Any Content, views, graphical objections, opinions and nonsense expressed on this site are solely those of the author and do not necessarily represent those whom he may have mentioned or any group or individual he may or may not have association with. If you are still not contented with this explaination.. Click This ..